Can I grow blueberries in a pot? Absolutely! In fact, in a lot of areas, growing blueberries in containers is preferable to growing them in the ground. Blueberry bushes need very acidic soil, with a pH between 4.5 and 5. Rather than treating your soil to lower its pH, as many gardeners would have to do, it’s a lot easier to plant your blueberry bushes in containers whose pH you can set from the beginning. Keep reading to learn about how to grow blueberries in pots. 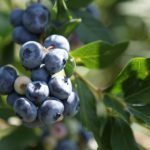 Growing blueberries in containers is a relatively easy process, but there are some things to keep in mind beforehand to ensure your success. When selecting the variety of blueberry you’re going to grow, it’s important to pick a dwarf or half-high variety. Standard blueberry bushes can reach heights of 6 feet (1.8 meters), which is awfully tall for a container plant. Top Hat and Northsky are two common varieties that grow to only 18 inches (.5 meters). Plant your blueberry bush in a container no smaller than 2 gallons, preferably bigger. Avoid dark plastic containers, as this can overheat the roots. Make sure to give your plant plenty of acid. 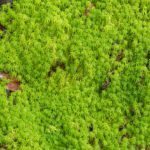 A 50/50 mix of potting soil and sphagnum peat moss should provide enough acidity. Another good mix is 50/50 sphagnum peat moss and shredded pine bark. Blueberry roots are small and shallow, and while they need lots of moisture, they don’t like sitting in water. Give your plant frequent light waterings or invest in a drip irrigation system. 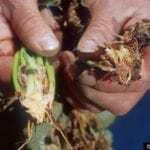 Growing any plant in a container makes it more vulnerable to the cold of winter; instead of being deep underground, the roots are separated from the cold air by just a thin wall. Because of this, you should subtract one number from your local hardiness zone when considering buying a container grown blueberry. The best way to overwinter your blueberry plant is to bury the container in the ground in mid-autumn in a spot that’s out of the wind and likely to experience a buildup of snow. Later in the autumn, but before the snow, mulch with 4-8 inches (10-20 cm) of straw and cover the plant with a burlap bag. Water occasionally. Dig the container back up in the spring. Alternatively, store it in an unheated building, like a barn or garage, with occasional watering.